The 147th British Golf Open at Carnoustie generated a £120 million benefit for the Scottish economy, according to an independent study revealed by First Minister Nicola Sturgeon on Sunday. The Open attracted a record 172,000 fans in July this year, and delivered an economic impact of £69 million according to a study by Sheffield Hallam University’s Sport Industry Research Centre. Scotland also benefited from £51 million in destination marketing activity thanks to The Open being broadcast on television to more than 600 million households in 193 countries worldwide. The study — commissioned by golf’s governing body The R&A, VisitScotland and Angus Council — also concluded that the Angus area alone received a £21 million injection of new money from The Open. Almost half of the spectators who attended The Open (49.8%) travelled from outwith Scotland, while the overwhelming majority of Scottish fans (84.8%) came from outside Angus. The research found 62% of non-Angus residents indicated they would return to the region for a break within 12 months. The Open is golf’s original championship and it is held in Scotland more often than any other country. The tournament was being played at Carnoustie for the first time since 2007 and this year’s attendance surpassed the 157,000 total set in 1999. A key aim of The R&A is to attract a younger audience to the Championship, and more than 20,000 spectators under the age of 25 attended this year. Sturgeon said: “The Open Championship is synonymous with Scotland as the Home of Golf, and this year’s Open at Carnoustie once again showcased Scotland internationally as the perfect stage for major events. 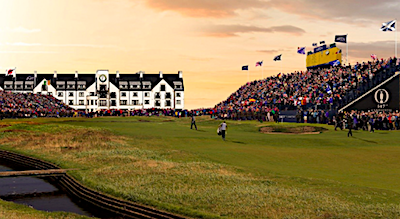 Martin Slumbers, chief executive of The R&A, said: “The Open has a proven track record of generating substantial economic benefit for the host country in which it is staged thanks to the tens of thousands of spectators who attend each year. “The return of The Open to Carnoustie has been a great success. Cllr David Fairweather, leader of Angus Council, said: “We were delighted to welcome The Open back, along with a record 172,000 fans. “We all enjoyed a fantastic event that attracted global interest and attention, as well as immediate and long-lasting economic benefits to local and regional communities and business. “£21 million of new money into the local economy is great news for Angus, its people, hotels, B&Bs, shops and restaurants. The 147th Open was played at Carnoustie from 15-22 July 2018. The Championship was won by Francesco Molinari for the first time. He won by two shots ahead of Rory McIlroy, Justin Rose, Kevin Kisner and Xander Schauffele. 2018 was the eighth time that Carnoustie has played host to The Open.